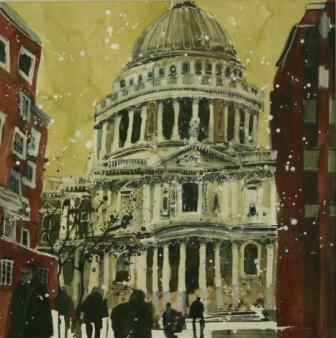 ''Autumn, St Paul''s Cathedral'' is an intimate contemporary portrait of such a well known London landmark. The watercolour shows Susan Brown''s skill in instilling life and movement to a scene. She captures the beauty of the old church building and portrays it with a lightness of touch characteristic of her contemporary style. Lines are not rigid but have a fluid quality which lends them life and light. Her use of a dramatic mustard coloured sky and falling snow complements the buildings and adds to the painting. Susan Brown has a distinctive and accomplished contemporary painting style and her watercolour paintings are much sought after. In addition to Red Rag British Art Gallery Susan Brown has exhibited at other leading British Art Galleries. Each painting at Red Rag is sourced from the Susan Brown artist studio and like all Red Rag British art and Contemporary art it can be shipped worldwide. Click here to view more contemporary paintings by Susan BROWN.